Sleeping in an environment where you might come in contact with mosquitoes or other bugs can be harmful to your health. Mosquitoes can carry harmful diseases such as the West Nile virus. A mosquito net is very helpful to protect yourself while you sleep and reduce your exposure to harmful bugs. 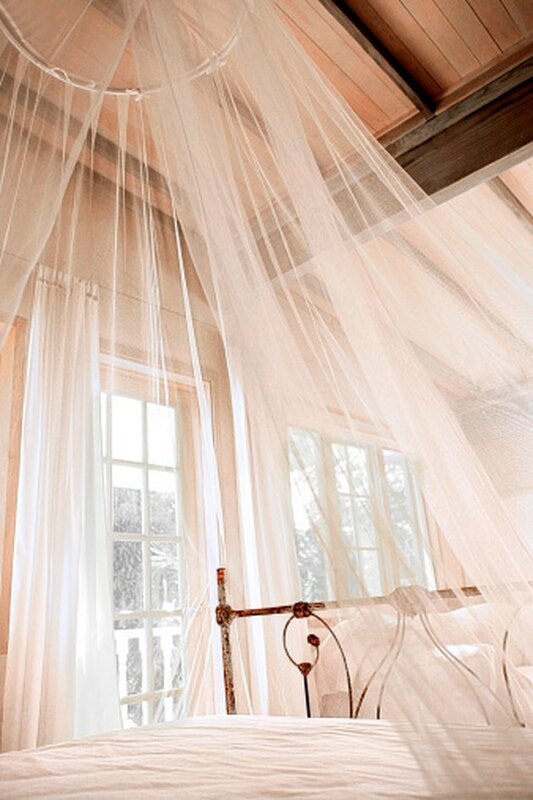 Use cotton sheeting and mosquito tulle to make a hanging mosquito net. Once the net is sewn, install hooks into the ceiling above your bed to hang the net. Mosquito netting is both decorative and useful for protecting yourself from unwelcome insects. Measure the mattress of your bed to determine how large you will need to make the mosquito netting. Add 3 to 4 inches to each side of the measurements to account for shrinkage at the top of the netting. Trim the selvages off the cotton fabric and cut them into smaller strips. Use the selvages to form about 14 loops, each about 2 inches. The loops will later be attached to the top of the net to hold the mosquito tulle in place. Cut the cotton and sew it until it forms one sheet. Use the measurements you took in Step 1 to make the sheet the appropriate size. Pin one of the loops in each of the four corners and then pin the other loops so they are spaced out evenly on all sides of the cotton sheet. Cut strips of cotton that are 6 inches wide. Cut enough strips to go around the perimeter of the cotton sheet plus 3 more inches. Sew the strips together to form one long piece. Pin the long strip all the way around the large cotton piece and sew all the way around. The loops should stick up through the seam so they are accessible from above the seam. When you reach the loops, double over with your sewing machine to make sure they are secured in place. You should now have a cap for your mosquito net, with loops at the top to hang the net from the ceiling. Cut a 1-inch strip of fabric and sew it along the bottom edge of the netting to finish it off. Leave a space so that the netting can open.